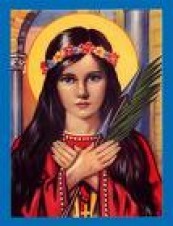 The cause of religious education is very dear to St. Philomena. At the present time when there is so much controversy over school questions, St. Philomena ought to be involved earnestly and assiduously by Catholic parents, teachers, and children, that their rights may be safeguarded, that schools may continue to function without hindrance and embarrassment from anti-religious agencies, and that pupils may receive their just allotment of public benefits. Please click on the "Contact Us" tab for more information.